The 2014 Honda Accord is the latest iteration of the automaker’s iconic midsize sedan, and it lives up to the expectations. It’s got distinctive styling, a comfortable interior, impressive fuel economy, great features — everything necessary to make it a huge hit among drivers from Mechanicstown and the surrounding communities. That said, at Middletown Honda, we understand the impulse to shop around — due diligence is crucial when you’re looking to make such a large purchase. With that said, let’s consider the new Accord alongside one of its top competitors: the 2014 Subaru Legacy. We’ll be among the first to admit that the 2014 Subaru Legacy isn’t a bad vehicle — but you should be asking yourself: what does the Legacy have to offer that the 2014 Honda Accord doesn’t? The 2014 Honda Accord LX with a Continuously Variable Transmission (CVT) is capable of achieving 27 mpg city/36 mpg highway/30 mpg combined. * That’s head and shoulders above the 2014 Legacy 2.5I with a six-speed manual transmission, which only offers 21 mpg city/29 mpg highway/24 mpg combined. Despite the significant advantage in efficiency, the Accord also gives you more power from its base engine, to the tune of 185 hp and 181 lb-ft of torque. The Legacy offers 173 hp and 174 lb-ft of torque. Dual-zone automatic climate control, delayed power retention, and a rearview camera are all standard features on the new Accord — and all optional or unavailable on the Legacy. The 2014 Accord also bests the Legacy in terms of cargo volume (15.8 cubic feet vs. 14.7 cubic feet) and passenger volume (103.2 cubic feet vs. 103 cubic feet). While the latter comparison may seem small, consider that Honda’s midsize sedan accomplishes this feat by giving you more hip room and shoulder room in the front and rear. 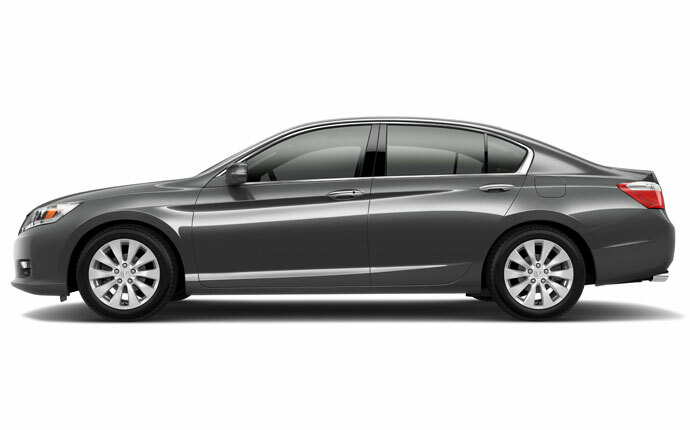 We’d love to tell you more about the 2014 Honda Accord in person. You can find our dealership less than two miles north of Mechanicstown, at 520 Rte. 211 E in Middletown, NY. We’d be delighted to show you the entire Honda lineup, as well as our impressive selection of used vehicles. We’re confident that we’ve got a car for you, so visit us soon!